It hasn't escaped even the most ardent of technophiles that smartwatches aren't exactly the Next Big Thing that a lot of companies were hoping. Even Apple is seemingly struggling, the lustre of the brand sucking in users - but the lack of sales figures seems rather telling. So when the founder of Pebble, the company that arguably started the smartwatch trend, tells me "our vision is not of building watches", it's not as surprising as one might initially think. Pebble is a company that's outperformed its startup status - the impressive feat of being one of the first 'big' smartwatches to market with a long battery life and compatibility with both Android and iPhones - and it's a brand that even those with no interest in buying a tech-filled watch will have heard being kicked around. It also just launched its latest set of gadgetry: the Pebble 2, an update to original Classic model, Pebble Time 2 which has a more 'fashion conscious' element and the Pebble Core, a clip on wearable that's new territory for the brand. But in many ways Pebble is a barometer for the smartwatch industry: a huge flame of interest and furore around the brand to start, but recently it let go 25% of its workforce and has been criticised for its retail techniques of constantly plumbing the Kickstarter well, selling three rounds of new products through the crowdfunded platform where some see it as as place for startups only. Does that mean this company - and smartwatches in general - are on the wane? Then again, it's hard to criticise a retail strategy when it works: Pebble was one of the first big success stories on Kickstarter, making $10 million when it launched its first smartwatch on the crowdfunded platform. Then it repeated the trick with the launch of the Pebble Time, raising even more at the second attempt. So when it went back again to do the same thing with the third round of new devices - which still proved popular - it forced new thinking about what the crowdfunding platform really is. 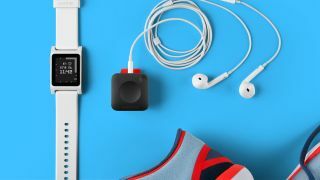 "With Kickstarter, 60% of [our customers] already had an account, so there's a very high overlap between Kickstarter's audience and ours," Pebble founder and CEO Eric Migicovsky told TechRadar . "It's a low barrier to entry and easy for people to back and buy. They understand the platform, so it's a bit of a no brainer. "We are a startup, against the largest companies in the world - so we'll take anything we can get. Companies who spend hundreds of millions on advertising, and we spend basically nothing." Pebble 2 vs Pebble Classic - what's the difference? It's tricky to say what the company is really advertising though - you'd obviously argue it was the new trio of products, but the main 'hero' product is hard to work out. Despite Migicovsky calling smartwatches the future ("People aren't going to go back to dumb watches," he says) it's clear they're not the primary focus for Pebble, as the spec boost to the wristwear is really minimal. So what is the future of a company that's only ever made watches? The clue is in the interloper: the Pebble Core. This tiny little device, so small that "if you carry it in your pocket you can't feel it", points to the future of what Pebble is trying to do. "Our vision is not of building watches but a network of devices around the body, allowing people to talk and live more efficiently," says Migicovsky. "Apple and Google are confusing people, [by] making a tiny smartphone on the wrist. People want great innovations, in a place where your phone doesn't make sense. In the long term we see people using their phone less as a central point of connection." That doesn't mean the brand is giving up on the watch model completely, with Pebble's CEO keen to point out that his company has "practically" sold more devices than Android Wear combined worldwide. However, the last big announcement for Pebble smartwatches smart bands, hasn't yielded many results: these accessories were supposed to add GPS, extra battery packs and heart rate monitors to really supercharge functionality - but months went by with little to show. Some are starting to trickle through now, but Migicovsky admits the creation of them "has been a little slower than intended" - so combined with the miniscule update to the Pebble smartwatch technology with the recent sequels, it's hard to imagine a thriving future for this sector. If the smartwatch was born out of our desire not to be locked to our phone screen, then the logical evolution for wearables is to become even more focused on a set of tasks. The Core is a fitness-focused device, one that Pebble claims strips the need for a phone by carrying its own GPS and 3G / Wi-Fi connection. It has a single button that will connect to a variety of apps - a single push could call an Uber or order a pizza, and will use Amazon's Alexa voice recognition to let you talk to get feedback and updates - as well as having a lot of decent technology to help track your runs. There's also something that no other company has managed before: bringing offline Spotify integration to something other than a phone, tablet or computer. While sticking music onto wearable devices is nothing new (arguably early MP3 players were small enough to be the first 'real' wearable) I've spoken to many companies who have tried to get Spotify onto a separate device but struggled with the digital rights management syncing tracks from the streaming subscription service. Apparently the Spotify integration happened simply because CEO Daniel Ek and his team used the Pebble smartwatch and enjoyed it, and Migicovsky and his team told him they had the perfect running-focused device - although having not been released yet, it's hard to say how well the wearable will fare in monitoring your trotting. The idea of the wearable moving beyond the smartwatch isn't only locked to Pebble - I spoke to Sony's senior vice president Kaz Tajima earlier this year about what wearables meant to the company given it's not made a lot of smartwatches of late but unveiled a number of dedicated products to clip onto the body - including smart headsets and cameras. "We have tried multiple wearable products within a couple of years and we started learning that rather than define a wearing style we should define the use case," he told me. "Say a smartwatch - it can do almost anything but there is no specific strong demand for a use case. "We try to specify the use case first, then define the form factor after. If the use case is voice interaction then maybe that interaction should happen by the mouth and ear, that's why we created this product [the Sony Xperia Ear] to put on your ear, and why it's wearable." Are wearables heading in the opposite direction to smartphones, diverging into dedicated tasks rather than a converged lump that can do everything at once? It seems that way, but even still, there needs to be a point to the diverged devices, the killer app that makes them attractive. The question remains of what that the silver bullet really is for wearables. However that's the beauty of where the technology is going - there are loads of new ideas that can be explored with targeted sensors, logging your life or augmenting your senses in powerful way. But Pebble's not going that futuristic: health is the next big jump for the brand, making its devices more of a fitness accessory than a simple way to avoid dragging your phone out of your pocket. Pebble Health launched in 2015 to start that, and Migicovsky claims there are more than 200 apps for the platform already. Given, that's not exactly groundbreaking: the Apple Watch was largely sold on its ability to help you get fitter, the Fitbit Blaze is the fitness tracking company's effort to break into the smartwatch arena and multiple dedicated running watches now offer smartphone connectivity too. "We're taking a different track to the Fitbits and Apples," said Migicovsky. "Instead of a static goal, it's about always beating yourself, beating last week's average, and that's a much better way to engage over time. "Incremental progress, that's the difference for us." Migicovsky says Pebble has a lofty goal: to create a personal trainer that knows your timeline and can help intersperse data at the right points, which sounds like an incredibly difficult task for a company that still sees itself as a startup with stripped back staff, and still doesn't intend to support Windows Phone or BlackBerry platforms in the near future (although, in fairness, it's not alone in thinking the user base just isn't vast enough to dedicate precious resource to). The CEO is bullish though, thinking Pebble has the hardware to let you do it. "It's not against some false premise, but we can send you a notification in the afternoon to get out of your chair and go for an afternoon walk, or when you wake up remind you that you lost an hour of sleep because you went to bed at 1am and maybe poke you to hit the sack a little earlier." Pebble's future is tied in heavily with that of the smartwatch; as one of the original purveyors of the tech, the fact it doesn't seem as hell-bent on improving its watches, rather focusing on a new wearable device, is damning for the smartwatch world as a whole. So clearly the brand has realised that to be successful, wearables need to be something more than screen extensions, to offer a new wave of technology into your life in a manner not yet seen before. Whether the oft-tried health route is the right one has yet to be proven, but with the Pebble Core Migicovsky clearly believes the new direction can yield growth. The Core does bring a large amount of technology, of sensors, into a tiny device to appeal to the current trend of run tracking - and the Spotify collaboration is genuinely groundbreaking, so if reviews are favourable, then the brand could have taken the lead in an innovative space. But despite opening up Pebble to new operating systems (the Pebble Core runs a modified version of Android for easier connection to networks), it doesn't seem that the brand is leaving its own-brand OS any time soon. When asked if Pebble will ever build an Android Wear device, Migicovsky laughs, then simply states that Pebble and Google have a "different perspective".